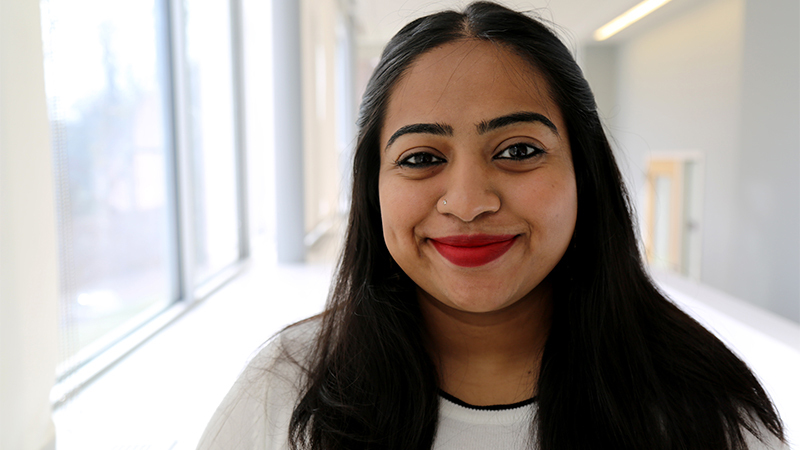 In the two months and few weeks since I packed up my life in India and moved to Massachusetts to attend the Heller School for Social Policy and Management, it amazes me that no matter where I look, there are opportunities to dive into new experiences. Some are powerful enough to transform our lives. 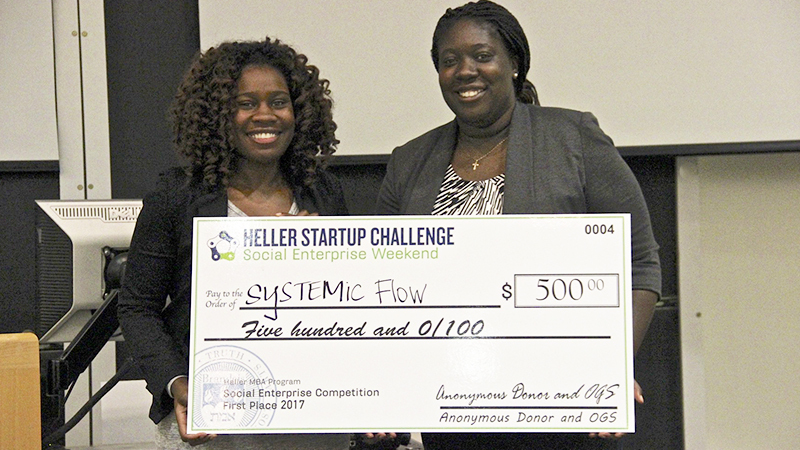 The Heller Startup Challenge, where students developed innovative solutions to social injustices around the world from November 3-5, was precisely that. As a student of Sustainable International Development (SID) and a former social entrepreneur who worked with local artisans and landless laborers, my mind is perpetually buzzing with potential solutions to global problems. But either due to the lack of resources or additional perspectives, these ideas seldom escaped the boundaries of my mind. So when I learned about the challenge, that in under 60 hours, we could form a team and win $1,000 to help make our ideas a reality, I was excited. Students form self-selected teams around startup ideas during the Heller Startup Challenge weekend. 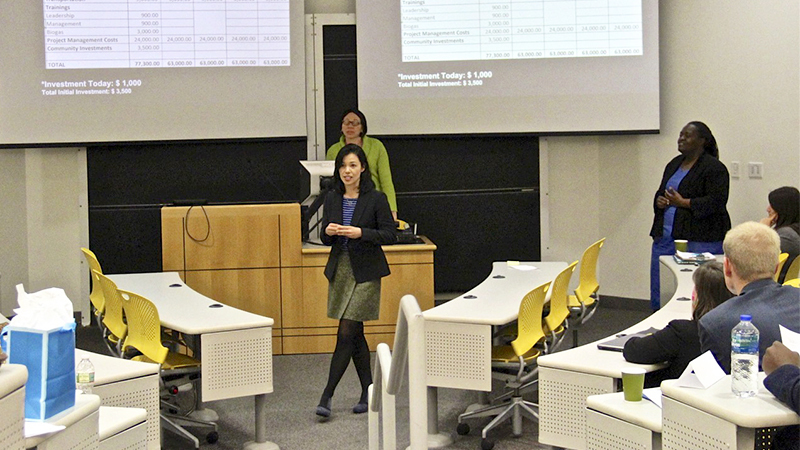 The student-led initiative, organized by Anna Jen, MA SID’18, Jess Peete, MBA’18, and team of Heller students, is now in its fourth year. Since it’s the rare pitch competition not based in a business school, it opens the door for students like me to enter the world of entrepreneurship. A student presents her startup pitch in front of a Heller classroom. The first day was nerve-wracking, as I stepped out of the comfort of my SID cohort and was surrounded by faces I had never met before. 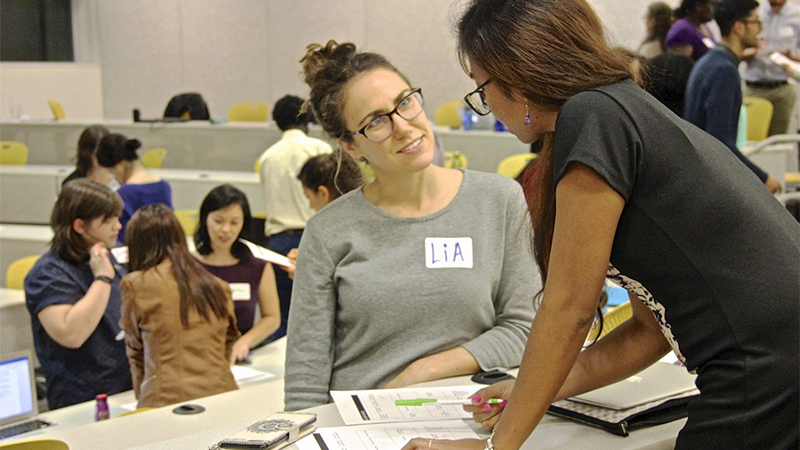 Participants not only came from every Heller program, from MBA to MS in Global Health to MPP, but also included undergraduate students and alumni. But after the initial ice-breaker, our soft murmurs at registration turned to loud laughter and warmth. Then, it was time to pitch. Sixteen of us shared our initial ideas in under three minutes each. and my own idea, I’M IN, a social information resource for international students in the greater Boston area. Like each pitch that won that evening, I was over the moon. I found immense strength and joy from the fact that others found my idea valuable. But with 48 hours to go, there was no time to celebrate—I had to get to know the students who joined my team and figure out a way to deliver a fully-functional business plan in just two days. Luckily, the next morning, we had the opportunity to turn a group of mentors for guidance. These included Heller alumni and faculty, as well as other professionals working for a variety of local and global organizations. For those 48 hours, even though we were still within the walls of Heller, we left our student lives behind and transformed into professionals working to provide a sustainable solution to a real-world problem. Mentors offered new challenges as well as solutions for us to consider. We saw our idea move from being a silhouette to taking concrete shape. But the process was tough. We debated, we challenged, we calculated; we stretched our minds however wide we could. Some of us even had sleepless nights, our minds buzzing with ideas to make our plan even stronger. Though many of us had just met on the first day of the Challenge, we all embraced our common goal with a passion that seemed like we’d worked together for eons. Then, it was time for the final, six-minute presentations before a panel of judges, including Heller MBA Program Director Carole Carlson. Their insightful questions and thoughtful feedback gave each of us confidence—as well as ideas on how to refine our solutions. The first place team, Nomad Dairy. In the end, Carlson announced the winners. “At Heller, we like stories that tug at our heart. And that story today is Nomad Dairy,” she said, which was awarded $1,000. People’s Choice winner sySTEMic Flow was awarded $500. The winners were met with resounding applause and a standing ovation from the audience. The second place team, sySTEMic Flow. 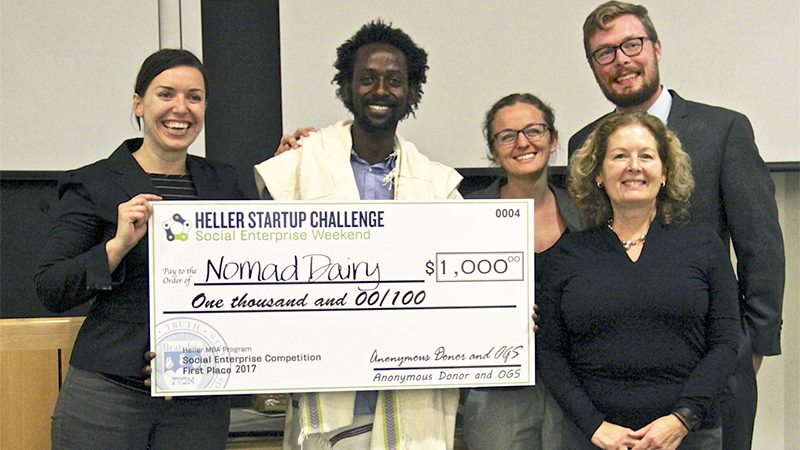 For Nomad Dairy founder Roba Bulga SID’18, winning the Heller Startup Challenge was just the first step. 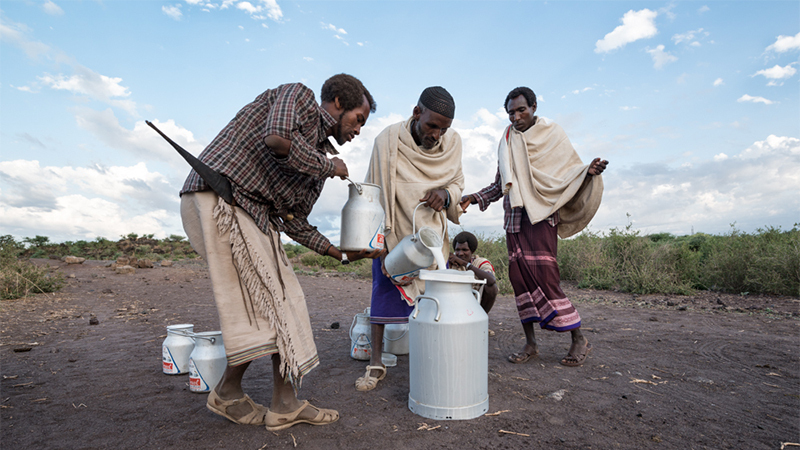 “Our mission is to support the Karrayyu [nomadic herders in Ethiopia] during a time of rapid change, using sustainable approaches that are socially and environmentally friendly,” said Bulga, who is from Ethiopia. He noted that the biggest challenge is keeping camel milk from spoiling in 90-degree Fahrenheit heat during the several-hour-long trip to the market. To solve this problem, Nomad Dairy will put the funds from its win toward research and consultation, then work with the herders on a solution. He’s planning to pitch his plan at other competitions, including the Hult Prize, to explore how to scale up his business model. Like Roba, I’m just starting my entrepreneurial journey at Heller. Though I do not yet have the resources to convert my pitch into an enterprise, my experiences at the Heller Startup Challenge haven’t gone to waste. We’ve launched a student-led support group aimed at helping international students navigate their life here at Heller, thanks to support from my SID cohort. From learning how to use Microsoft Office and Google Suite for assignments to choosing the best grocery store and the right kind of winter clothing to survive the New England winter, I hope our collective wisdom can make life more comfortable and less stressful, as well as strengthen our community of diverse perspectives at Heller.